Dry up those tears and throw away your Sea Breeze astringent and Proactiv regimen. Skin whisperer and author Marie Veronique Nadeau wants to help you treat your pimple problems the natural (-ish) way. She’s not asking you to sing kumbaya to your pimples nor does she think that just because a solution is natural it will work — she just doesn’t want you to wage an all-out attack, throwing everything in your medicine cabinet at your acne. 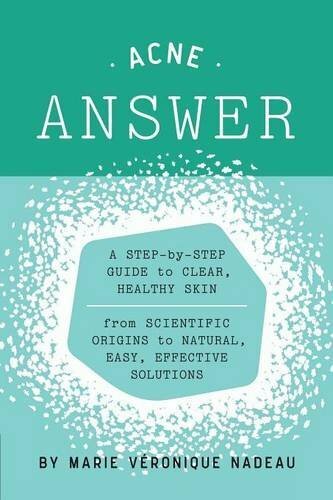 Her new book The Acne Answer: A Step-by-Step Guide to Clear, Healthy Skingives you natural and organic remedies that yield long-term results. But, she also tells you when it is necessary to call in the big guns like Accutane and retinoids. She’s just tired of dermatologists going to the big guns first. So put away your arsenal and hear what this skincare Svengali has to say. Spoiler alert: germs are your friends. You deal with so many skincare woes – aging, sensitivity, rosacea, etc., why tackle acne for this book? Adult acne is becoming a minor epidemic. According to the Journal of American Academy of Dermatology, 54 percent of women older than age 25 have some facial acne. The rise of acne in adult women is often attributed to inflammation and stress, but over-treatment with antimicrobials is another cause. Why are antimicrobials the enemy? I thought they were supposed to help clear up acne? All these years we thought of microbes as “eeew germs.” We just want to wash them away and get rid of them, but no! Our skin needs the right balance of them to be happy and healthy. What you want to do ideally is enlist the aid of the microbes that are there to help you out. Because they want to help – they have a vested interest in keeping your skin healthy. The microbes are your friends.